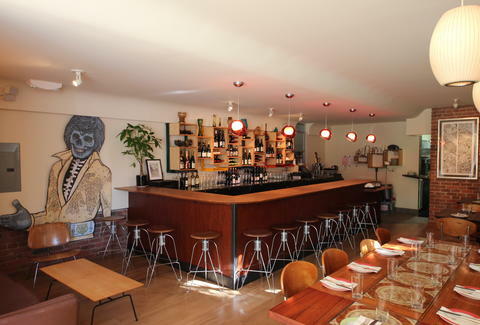 Besides being something you never, ever, ever, ever (seriously ever) want to flash in the Tenderloin, 20 Spot is also a Mission-based wine gastro-pub from the guy behind Bacchus, slid into an old record store along with seating for 38, several couches for clounging (casual + lounging! ), and a giant graffiti artist-made "Skelvis" spray-painted on a piece of plywood that once surrounded the place during construction. 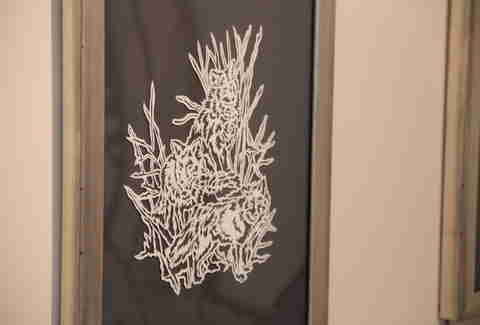 In addition to Skelvis, they've got a series of art that features an amalgamation of painstakingly cut paper, including this three-wolf print that really makes you wonder... waitforit!... howl they do it. 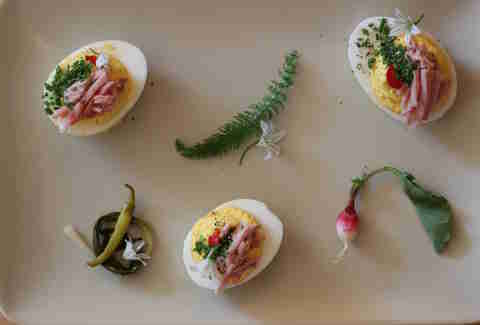 With a vet of Berkeley's now closed Sea Salt (RIP) helming the kitchen, the American bistro fare raises the bar with plates like these three ham-topped, deviled duck eggs. 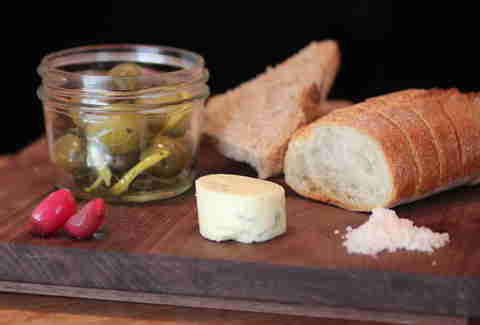 Or there's this appetizer bread and olives plate with homemade thyme butter and... what's that? Is that Lot's wife? What's she doing here?? And they've got meatier fare like this pork loin sando with apples, curry mustard, and rarebit, which, surprisingly, is melted cheese and not a rabbit-type Pokemon. Wait, this is a wine bar? 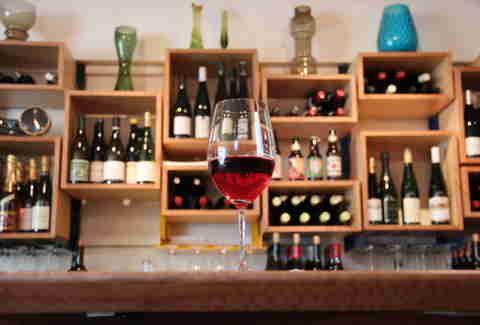 Oh yeah, they've got an expanding list of more than 60 wines, plus two drafts (Linden Street's California Common Lager and 101 North's Heroine India Pale Ale), plus five bottled brews that you can either drink, or trade in the 'Loin for, um, wait. Don't trade those. PROMISE US!